But that certainly doesn’t imply that the shows by Le Patin Libre aren’t virtuoso. “Even if we are doing something totally different, as a group we want to maintain the virtuosity and that extreme control over the body. Four of us are former champions in various styles: ice dancing, freestyle, etcetera. We all have different qualities and a different physique. One is tall and has specialized in martial arts as well as skating, I myself am a small, explosive jumper and Pascale Jodoin – the only lady in the group – is extremely feminine but at the same time very muscular. 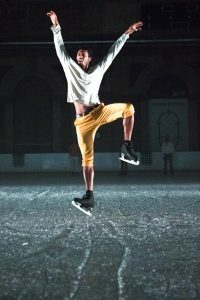 Hamel says that he has been able to make peace with figure skating because of Le Patin Libre. 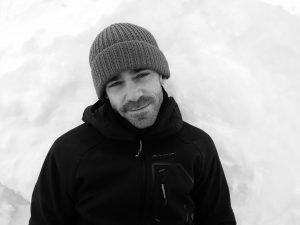 “Figure skating ultimately is something that is forced upon you as a child. Not necessarily by your parents as much as the ‘system’. Hopefully you start of your own free will, but then before you know it figure skating becomes your identity. Especially if you’re a boy. Everyone loves you, thinks you’re a ‘God’. The figure skating sport is a very conservative and lucrative world and that’s why – certainly if you’re parents have invested an enormous amount of money in you – it’s not easy to quit. Most figure skaters that I know are aware that it is cheesy and old fashioned what we do, but regardless we put on our biggest smile and continue. Fortunately, with Le Patin Libre, I have learned to appreciate again what I do and what I want to do. Now I am no longer ashamed. Now I’m no longer afraid to invite friends to my shows, I can be proud of what I do. Because I like what I do.